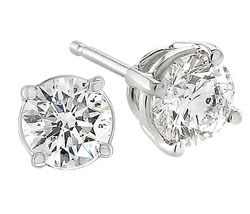 View our certified diamond stud earrings here. What better way to say, "I love you," than with certified diamond stud earrings. These little gems are a wonderful gift for people of all ages for any occasion. Diamond earrings complement everyone. Finding the perfect diamond stud earrings may require a little looking around. Contrary to popular belief, not all diamond earrings are made equal. You will want to consider not only the metal type, but the size, weight, cut, and clarity of the diamond as well. You may want to take a little time to learn about diamonds before making your final purchase. If you want to give the gift of quality certified diamond stud earrings, you should look for a stone that is nearly colorless and that has no visible imperfections. Novori only carries diamonds with a great color rating (D through J). We are dedicated to bringing you a great selection of the best quality diamonds. Look for diamonds that are certified by a reputable, independent gemological laboratory. Having a diamond certified ensures that the diamond has been thoroughly examined by experienced diamond graders and found to have the properties mentioned in the certificate. Without certification, one may purchase a diamond of lower quality than expected since minor imperfections in the diamond can only be found by using gemological instruments. At Novori, we use diamonds that are certified by the GIA and the AGSL (or EGL in USA) because of the excellent reputation of these laboratories. You will have the choice of yellow gold or white gold. The metal that you choose should be largely dependant on the tastes of the recipient. If it is for your wife or mother, you should be able to get a pretty good idea of which they would like the most. Consider what type of jewelry they wear most often. Do they have a lot of yellow gold? If so, that may be your best option because she will be able to wear her new earrings with almost all of the current jewelry that she owns. Round diamonds are the classic diamond shape, generally brilliant cut for the most sparkle. Princess cut diamonds are square and have a wonderful sparkle. Heart-shaped diamonds are exactly that, diamonds shaped like a heart. A heart-shaped certified diamond stud earring is a very meaningful choice.